The Second Battle of Benghazi: Really? The Second Battle of Benghazi. The first "battle" was of course the five-day blitzkrieg of Islamist militants and terrorists masquerading as "protesters" that briefly surprised its way to control of Benghazi on February 20/21, in a movement co-ordinated enough to seize all cities east of there as well, and of several in the west. The latter part of the late-March escalation, in which Gaddafi loyalist forces were blasted by superior Western air power, undeniably occurred, killing hundreds of brave patriots. It dramatically announced that "no fly" meant just that. Or rather, it was there for real, lie that it was. It's the part before that, the loyalist attack on Benghazi of March 19, that stands in question. It was said Gaddafi promised a mass-slaughter of everyone inside Libya's second city, a fair subject for this post as well. The proof was always semantics-based, aside from what we heard were the first actual attacks in that campaign, already showing troubling signs of random, overblown evil and a severe deficit of logic. I have already covered the quickly-discarded Gaddafi attack with one fighter jet - within a day the rebels acknowledge they shot it down, then that it was theirs (they have jets? ), then that loyalists shot it down. Proof of how close they were to the city's gates... sort of helped the "no fly" thing despite failing ... the Libyan forces were the ones already enforcing a genuine no-fly zone, allegedly. I do have some research on this, but nothing coherent enough to be able to write a post. I open it for comments and will submit some highlights myself, only later pulling together a summary of the evidence for any such attack. Mohammed Nabous issues will be covered separately in this post. First post of the New Year. Happy new year to all! Mohammed al-Nabbous was a semi-famous Internet Rebel propagandist in Benghazi, who gave his life and vanished in a puff of drama March 19, a martyr to proving the "second battle of Benghazi" had been started by Gaddafi's forces of darkness. What the heck was up with that guy? Did he really die? If so, from what? The rest, in the comments section. Faking the Conquest of Tripoli: Really? Just before the fall of Tripoli Libyan propagandists were claiming that a copy of the Green Square had been set up in the desert near Doha, Qatar. When Tripoli was taken in August a video of rebels on the Green Square was first broadcast on al Jazeera on August 20th. Some Green supporters claimed that the video footage was fake and filmed in Qatar. I thought the story would die in a matter of hours, unexpectedly it is still alive and kicking. 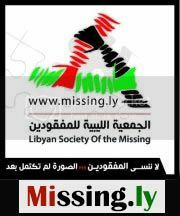 Here is one of the original posts on Libya S.O.S. Here is one recently posted version in Finnish. I am afraid anyone sticking to this story will loose all credibility. Who were the rebels on the Green Square on August 20th? Where did they come from? Where did they go? I have not much to offer, but here is a spot where anyone burning to know and share on this subject can post related comments. I will add that on the apparent studio rigging next to the compound: Yes. They had been filming somewhat epic protests there against NATO/Rebel intervention, so the real Green (aka "Martyr's") Square had become in a sense a studio set. The fake studio set version of it you could spot by the lack of such scaffolding. They wouldn't want it to look like a studio! Rebel/NTC types are obsessed with a huge list of names they have of missing people feared killed by Gaddafi people, a mammoth pile of unclaimed loyalist corpses resulting from their joint victory with NATO nations, and a desire to find a plausible sounding way to match the two. But problems will be glossed over. Most of the alleged Gaddafi victims we've seen are black-skinned, whereas the missing that the new government concerns itself with seem by all sources to be almost totally light-skinned Arabs. And there are always valid question of whose custody the dead were last in. Sometimes it can be proven that a supposed Gaddafi victim was actually a loyalist or suspected one known to have been detained by rebel forces. The primordial example is the "al Baida massacre," where someone in the Libyan media (ignored) noticed the same exact black man with a hunched back and distinctive sweater, and other probable matches, among two distinct groups of people troubled in February. One video showed nine captured soldiers and suspect "mercenaries" sentenced to die by Islamist rebel fighters. Another later video shows some of these among 22 soldier-types (out of 300 total) killed by their own officers (or by mercenaries) for refusing to shoot innocent protesters. I might explore the idea and its applications here a bit further, but for now wanted to open it up for any possible match like that anyone has made that hasn't already been done somewhere else. If it's a good enough guess to warrant ruling out at the least, bring it here. The emphasis is on visual proof, but if you have good enough reason, more circumstantial evidence can be called on to establish rebel control over people later found brutally executed. Or submit excellent matching work that has been done already. The stuff out of Sirte, with the mass grave photos to work off of, has been quite fruitful in proving rebel war crimes the West cares not one iota about. I'll start with a possible match I noticed recently. First, a black man captured in Tripoli, Abu Salim I would guess. Date unsure, but I'd guess Aug. 23 or 24. He certainly looks worried about the foreshadowing these guys are giving him. Image found on this page full of many, many, other fascinating scenes like it, some quite shocking but none gory. Details and credits unknown. Then, a photo from Human Rights Watch. Corpses in the tents behind the makeshift field clinic outside Bab al-Aziziya. The dead black guy in the background is interesting too. These should be and eventually will be added to the Roundabout area victims list, along with a few others I've discovered since last update. The orange "tank top," general skin tone (it can lighten with decay or darken), general build, and history all suggest this could well be the same guy. Cause of death uncertain, but these victims seem to have died largely by the sword, not the bullet. Most seem to be activists camping there, but it's not impossible "mercenary"-looking people (sporty clothes seem to help) would be killed and brought here to be seen as "Gaddafi fighters." The first image might be from a video. If that's so, and anyone can find it, I'd like to see more. Do we see the captive's right wrist? Back of his head? The main problem I have is the tall hair we can see on top vs. the victim's, appropriately curly but buzzed short all the way to the top, it seems (not so clear here, but I have an enhancement I might share). But it might get tall only at the front, unseen here. I've had readers/contributors here suggest I start a number of different posts where related discussions can happen and the issue be developed. Some of these I hadon a list in my head I seem to have lost. So for anyone with a request for a split-off post, a new post, or anything like that, in a comment here is the best place to put it, where I can double-check if I've done them all. No promises the posts themselves will have anything but some notes to explain what all the comments beneath are about. Any mysteriously killed human body of late August, not yet clearly covered in another, identified, Tripoli Massacre, can be compiled here. 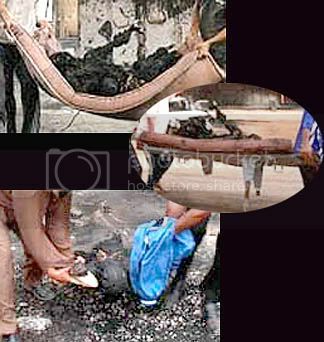 Two corpses are sprinkled with "chemical powder" by volunteers, on a bridge "in the al-Intisar neighborhood of Tripoli, August 27." The one we can see, now ghostly white, is a black male, dumped on the curb. I cannot locate this "al-initsar neighborhood." There is a reference, and widespread, to a school there where "mercenaries" were housed in late August. That doesn't help locate it. however, aside from one source which specifies it's in central Tripoli. Petri ha(d) a locale, but it was wrong (self-corrected). He's got another one (see comments), and I'll finally check it out later. 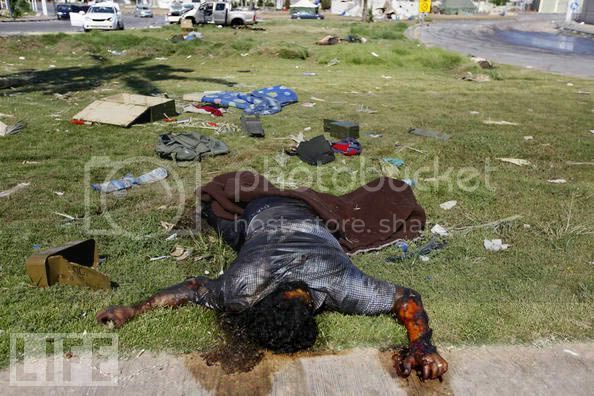 A dead body lies in the streets of Tripoli, Libya, Aug. 26, 2011. Bystanders claimed that he was a black African mercenary. 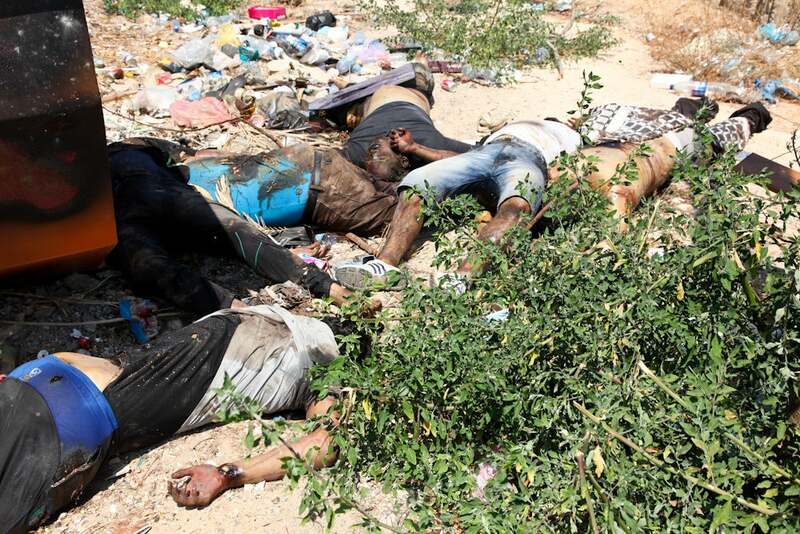 Rebel fighters exhumed a body from a grave in the Yarmouk neighborhood of Tripoli containing four dead men alleged to have been killed by retreating Qaddafi forces as Tripoli fell to the rebels. Credit: Moises Saman for The New York Times Photo2: The fighters chanted "Allah is great" after exhuming the bodies." The third, scanning around for any more remains. The Yarmouk neighborhood might mean around the Yarmouk base, where the infamous and massive shed massacre is said to have gone down. This photo caption suggests as much. Quite possibly related to the above, on Sept. 11 two mass graves, containing up to 20 people total, were "discovered," as the BBC reported, "just off the 11th June highway, in the Souk al-Jumua area to the east of the capital." But in the aftermath of victory, many corpses have been found, some of slain Gaddafi soldiers, others the victims of killings in cold blood. A Libyan official said 75 bodies had been found at the Abu Salim hospital, which was caught up in heavy fighting, and another 35 corpses were found at the Yurmuk hospital. The possibility that rebel fighters executed captured Gaddafi soldiers would pose an image problem for the NTC. Yurmuk again suggests near the Yarmouk base. These 35 bodies, or any buried nearby and later exhumed, could be among the dead we know of from the shed massacre, the eight victims surrounding the shed, and the 22 black guys dumped behind a mosque nearby (same link for the moment). But they could well be others, raising the death toll of that mysterious episode - or cluster of episodes - to more than 200. "The rebels asked them to surrender but they refused," said resident Haitham Mohammed Khat'ei. "Residents of the neighbourhood decided to bury them in accordance with Islamic law," he told Reuters. Reports of cold-blooded killings by both sides have surfaced in the last few days, darkening the atmosphere in a city where many had greeted Gaddafi's fall with joy. 22 black men, found August 27... is Tajoura close enough to Yarmouk this could be the mosque dump? I had to double check how far east Tajoura was from this southwestern district. It's a good ten miles in between, and the mosque victims were filmed still laying on the road, apparently just discovered, the afternoon of August 28 when these were having graves dug at least a day earlier. So in two ways it's unlikely these are the same, and we have two separate batches of 22 black men - among many other batches of varying numbers - winding up killed in Tripoli within a few day's span. A bit of pigment in these five bodies laid on the sidewalk, but only one seems fully black-skinned. One hasa horrible burn on his side I can't see how to explain from fighting asopposedto torture. One has pants half-down and a hole in his cheek, perhaps an exit wound. I know there are some, but don't have them ready to list yet. Taking submissions and/or solutions. What's unusual here is the dark tone of the report, and the faint suggestion (at 1:25) that rebels might be responsible for what happened at the Hospital. What's altogether new to me is the information at 2:15, about the executed black would-be refugees dumped next to the hospital (covered somewhat here). Previous reports said 19 or 20 bodies were there, all men. This says there were 22 victims, including "two women, two children, but most were men of fighting age." It's not entirely clear what Thomson's criteria were for saying"children." He could have meant teenager, and actually seen a 20-year-old man who's just a bit small. Even gender cannot always be adduced correctly from decomposing bodies laid in strange postures. But Thomson has more experience than usual judging by his Channel 4 bio, covering as many war zones as anyone else around. I'll givehim credit here, especially as it's supported. Andrew Simmons for al Jazeera was the first journalist at the hospital on the 26th. For an interview with National Public Radio, he confirmed women at least were among the dead. BLOCK: Were these men, women, children, Andrew? SIMMONS: We could make out men and some women, only a few. We didn't see any children. And we weren't really in a position to be forensic over this. And The BBC's John Simpson, who called the scene at the hospital "one of the most terrible incidents of the revolution," was among those reporting "more than 200 decomposing bodies" and the BBC report specified that he "found corpses of men, women and children on beds and in the corridors of Abu Salim's hospital," in addition to the ones on that pile outside (or was this a minor error of presumption?). There are other points of ambiguity with the total number of dead on-site. Was it 75, or "more than 200" at its highest point? Did the number fluctuate, and if so, why? Did anyone else report or even show women and children among these ambiguous dead? Because their killing - often on-site and by the blade - is the real problem, rather than their being left "unattended" afterwards. And one side rife with sword-waving, unaccountable, spoiled-rotten, uncontrolled, Islamo-nihilist slaughter jackals stands out as both culprits and as the nation's new rulers. If women and children were among those executed and abandoned at the hospital, the obvious question is what it means. It doesn't really look like a policy of anyone's to kill the populace indiscriminately. By all evidence, the numbers of kids and women are too low to be the main plan. But something unusual was at work here, putting families in whole at a risk that was too great in at least a few cases. My best guess builds right off what I've already observed. Near these dead are quite a few blankets, which are often handy enough when dead are concerned, but also pillows and clothing, cardboard boxes and plastic bags. Those planning to flee from rebel "liberation"might carry the former inside the latter, piled in the car. They might go as families, hoping to escape in time. Dozens of cars were left abandoned all over that area, rammed off the road, doors flung open, hoods popped, disabled. The drivers of these cars of Abu Salim are presumably arrested or dead. Most of the dead we've seen dumped about are adult males, but like anyone else, they had families, and some perhaps had them right there. One man shot near his car (victim #9, graphic photo, listed and placed with others here) wore a wedding ring, and had a baby blanket left nearby. One could presume from this the rebels had a policy of physically sparing women and children as usually done. But they seemed to quite freely execute daddies who tried to flee suspiciously. It's not too hard to imagine in this climate a few women and older children, the spirited ones, refusing to be parted from their husband/father, refusing to leave their assailants eyes intact, and having to be, unfortunately,"put down" alongside their main target. It's not the only option, nor the best, they'd be aware. But is the quickest. If so, they'd be dumped with the rest, no problem. It's a bad guy thing, so the bad guy "Gaddafi regime" will be blamed. Let those who flee and kill at the same time be blamed as the killers of these attempted refugees and go down as child-killers and women-killers that the humanitarian rebels were always just barely too late to save the country from..
And an update on investigations into who carried out the slaughter of men, women, and children, inside and around this hospital full of wounded loyalists: Nothing I can find. The only new story in a news search is about 100 surgeons who had a workshop at the trauma hospital in mid-December. Officially, it seems, loyalist snipers wounding people, a cowardly loyalist staff who ran from those snipers, and simple neglect still explain the gunshot executions, throat-slitting, and beheadings that occurred inside this one among many black holes of "Free Libya's" emerging new history. And anyone there who knows, who escaped, who can see and care, will be scared shitless to say anything about it. At the moment, Tripoli's doctors - those found disloyalist or neutral enough to remain free, alive, and working - are still trying to get guns as banned from their hospitals as cigarettes. This comes after a hospital worker strike, following months of repeated incidents like this minor battle, and more recently thuggish behavior in broad daylight that hasn't quite been fatal yet, per the BBC's report anyway. The concerned health workers might be among those aware of the staff at Abu Salim's onetime inability to prevent guns and swords being used there, dozens of times over, turning the place into a veritable slaughterhouse, one with even less government oversight or concern than there would be if cattle were killed there. The following is not officially (per NTC sources) a massacre of any sort, and may not be one even in reality. But quite a few people, over 100 by some reports, were killed on October 24, four days after Muammar Gaddafi and 100 with him were killed, capping a brutal campaign of massive shelling and bombardment and an effective life embargo, massive arrests, and numerous cruel massacres yielding several hundred anonymous dead dumped in a mass grave, blamed on Gaddafi loyalists (see the link above for details). This incident was blamed not on loyalists, just then becoming a shadow threat only, but on accident. 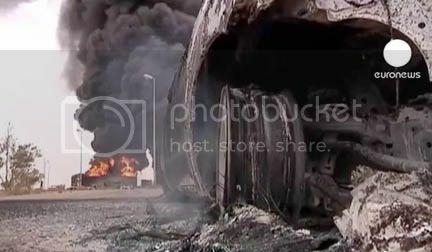 Reports from commanders and locals say about 50 to more than 100 were killed, while lined up at a fuel depot, in an explosion sparked by a neighboring power station. Many bodies were of course left charred beyond recognition, but many others survived. If an accident, this incident is a testament to the harsh realities imposed on the people of Sirte. The fuel embargo was meant to stop them living until they surrendered (along with de facto food, water, electricity, and medicine embargoes). With wartime damage everywhere in Sirte, when the electricity is switched back on, something could go wrong. Specifically, as Euronews reported, "there are claims that the facility was damaged by NATO bombs and blew up because of an electrical short circuit when power was restored." Otherwise, there's the possibility I'll mention without marrying, that this was an engineered inferno to explain the many dead they had already parked there and burnt to anonymity. The survivors, as far as I know, could be just made up, to make it sound more realistic. Should the Sirte massacres be expanded by 50-100? I can't yet say one way or the other, so I won't. “There was an enormous explosion and a huge fire. More than 100 people were killed and 50 others wounded” in Monday’s blast, a National Transitional Council (NTC) commander, Leith Mohammed, told AFP. “We are still unable to put out the fire,” caused by a spark from a nearby electricity generator, said Mohammed. The accidental explosion came as a crowd of people waited near the fuel tank to fill up their cars...An AFP correspondent said the tragedy took place near Sirte airport, some 30 kilometres (18 miles) south of the Mediterranean city, hometown and last bastion of Libya’s slain veteran leader Kadhafi. A radio station and two large fuel reservoirs stand nearby, said the correspondent, who saw at least 29 vehicles blackened by huge flames that shot into the sky, burnt shoes, melted plastic jerrycans and shreds of clothing. “The explosion happened yesterday (Monday) at around noon,” said Ali Faraj who helped evacuate the wounded. “It was very strong. I live 25 kilometres away and I heard it..Omran Ajelli, a doctor at Ibn Sina hospital in Sirte, said he treated 26 people, five of them “in critical state” with severe burns, and three bodies were brought in, with the other casualties apparently taken elsewhere." Some of the victims had returned to the town, the last bastion of resistance by Gaddafi loyalists, which fell on Thursday, to inspect the damage to their properties, the NTC commander added. Dozens of people are dead after a blast tore through a fuel depot in the Libyan city of Sirte, local officials say. The exact number of people killed in Monday's blast is not yet clear. A local resident told Reuters that about 50 people were killed. The Telegraph, meanwhile, cites a National Transitional Council official, who put the figure at roughly 100. Jalal al-Gallal, a spokesman for Libya's National Transitional Council, said Tuesday he did not have further details about the explosion. He said Ali Tarhouni, a cabinet minister, would provide details in a news conference later in the day. The explosion in the coastal city was likely the result of an accident, reports said. Photos by Youssef Boudlal, Reuters, exclusively, I think. Locals gather: one man who doesn't want to be seen, one who looks almost happy at this fire. At right, excerpts from all three images with bodies. They might all three show the same one, and they show no more than two. They're among the extremely charred. Reuters (see video below) counted fifteen cars and saw only "at least two bodies" removed. Cars "lined up in a cue" or simply parked all around? How far down any "line" would the fire spread? If there's a big path of fuel connecting them all, why? This vehicle shown on the Euronews video is at a good distance from the epicenter. I cannot see a fireball from the depot reaching this far, but the path of blackened pavement around suggests the fire followed some line of spilled oil that people should have had a moment to leap out of. Perhaps they did, at this distance. For what it's worth, we have a location. I found it on Google maps, but didn't think it was it, but petri says it is. I haven't verified that, but I think he's right. Anyway, here's the spot, within a spot, within a spot 10-11 miles the south of Sirte. It's at the end of a long dead-end road, a decent drive from Gardabya airport. It's defineitely an out-of-the-way spot for civilian motorists to fill up on... some type of fuel. If as the rebel commander said "Some of the victims had returned to the town ... to inspect the damage to their properties," they likely drove out and back in, in cars that, like normal ones, run on gasoline/petrol. They would have gone where gas was more available than in tightly-squeezed Sirte (anywhere else in Libya), and must've filled the tank at least enough to return, and maybe fill some gas cans too. So why, on returning, would they go fill their tanks in Sirte? And why at this presumably damaged or drained depot, of fuel we're not even sure is gasoline, ten miles south of town when most would be returning from the east or west coastal roads? 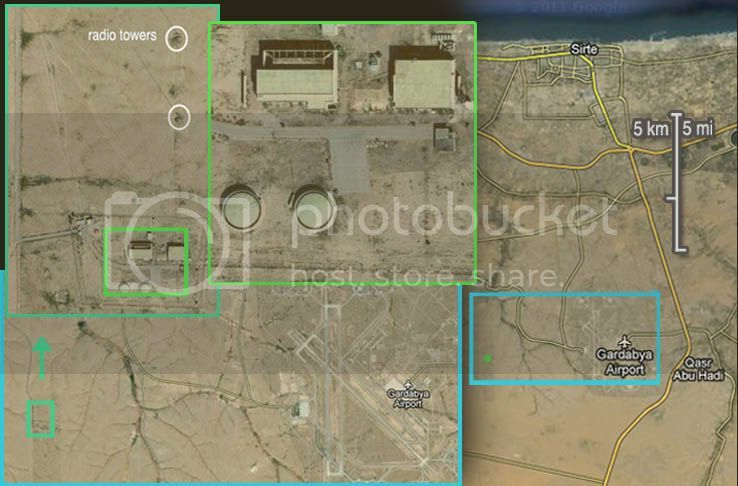 The compound in the desert, west of Sirte airport is a radio transmitter, operating most likely in the long wave band. The Wikipedia article states Libya has a long wave transmitter, but no Libyan transmitter is included in the list of longwave broadcasting transmitters. There are two building in the inner fenced area. The one on the eastern side is the radio transmitter. It is connected by an aerial cable to two guyed steel masts standing some 150 meters apart, due north of the transmitter. The shadows indicate the masts may be over 200 meters high. Long wave transmission uses high power; this transmitter in Luxembourg transmits at 2 megawatts. The building to the west must be an emergency power station, most likely with diesel generators. The fuel in the tanks would be diesel oil, also known as light heating oil. The story still does not quite add up. If this was gasoline (UK: petrol) the high number of victims would be easy to explain. Diesel oil is is however very difficult to ignite, and even less likely to "explode." Even if one was able to ignite one tank, how would the fire spread to the other tank? Another 18 bodies were found rotting in a dry riverbed between Gargur and Gaddafi's shattered compound at Bab al-Aziziya – further evidence of apparent [Gaddafi] war crimes. The BBC also mentioned these victims, and that some wore medical clothing, as they mapped out the murder scenes on August 31. It's not as precisely as I do (the massive shed massacre was down a different road, more due south, for one). Human Rights Watch, report from August 27: "Libya: Gaddafi Forces Suspected Of Executing Detainees"
First do note what the rebels had likely been doing in the days before they took control-fighting and killing in the area to establish control. Human Rights Watch was cited in the above reports, and has a photograph of the six behind the bin that I hadn't seen before, accompanying their report (see at right). These are described as "in the dry riverbed between Gargur and Bab al-Aziziya, Gaddafi's former compound." 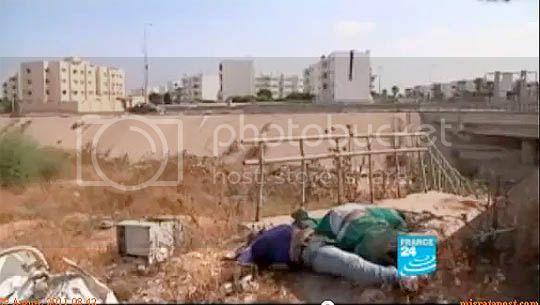 Another victim from the same area, it seems, is shown in another HRW photo. He at least was clearly a Black African man, shot in the head, on-site. As they put it,"The body of a dead man lies with his hands tied behind his back in the dry riverbed between Gargur and Bab al-Aziziya." More clear Gaddafi crimes? Two Youtube videos I've seen lately (links later) show the site of four more executed bodies, along the same river, somewhat near another orange trash bin. Two of these wear what could be surgical scrubs of slightly differing shades of blue-green. The better view is at left. It shows these two victims, unbound, but apparently shot in the head. They're both black males, laying on a concrete walkway with hand rails. Another apparent black man in light blue lays a ways off on the street's edge. The fourth victim, in purple, is all but invisible there, while the first one is all but unseen from the following view, from France 24 (right). It's a colorful lot. This victim too seems darker-skinned, if not quite to the same degree. His head isn't visible. Update Dec. 26: A photo from The Atlantic (below) shows the man in the blue shirt has an intact head and face. It could be his eyelids, but it could be his eyes themselves that look so wrong - possibly popped out. The weeds artfully obscure a clearer view. What looks possibly like his hand in the foreground is more likely the foot of the victim in blue who visibly lost so much blood there. A giant portrait of Gaddafi dominates a wall to the east. This might help confirm the location, but I don't think it's needed. Update Aug 28 2012: A video Petri found a while back shows where some of the other bodies in the wadi are, and lets us see these bodies close up as they're all removed. The guy in dark blue/purple has been loaded on a truck, shown face-up at 6:30. Again, he looks like a dead Black man with puffed-out eyes. Location: easy. A ways southeast of the other site. The actual stairs leading down to the underpass walkway aren't totally clear in the satellite imagery, and the video shows the segment of walkway blasted at an angle by some prior violence. The highway crossing, the opposite buildings, tree and shrubbery patterns, even the black car across the street, next to but not under the car port, all prove the fit. This is it, relative to the eight bodies mentioned above,and the piles of executed, largely black men closer yet to Gaddafi's compound. These would have earlier been called "Gaddafi's African mercenaries," but now they're left in the open and called ordinary Libyans, their callous murder blamed on the crumbling regime. "Return to sender" seems to be the subliminal message beneath the transparent lie in all these cases. That makes eight,plus the lone victim in his own photo, plus these four for a total 13 of the 18 we've apparently seen and can mostly place. Human Rights Watch is clearly hearing about the same incident for their August 27 dispatch. Their bizarre information came from concerned locals who have Black Gaddafi mercenaries doing the killing of this race-indeterminate, rebel-supporting, out-of-town but non-violent, ambulance crew in the midst of the fight for Abu Salim. Salah Saeed Kikli, 52, a medical laboratory engineer, told Human Rights Watch that he saw Gaddafi fighters in green military uniform kill two unarmed men, including one in medical scrubs, at a checkpoint by his home on August 24 around 11 a.m. after the fighters had previously approached him and threatened to kill him. I was fixing my car. An African came to my corner [of the street] and asked if I was civilian or military. I said I live here. There was another [black man] behind who said, “if he is civilian, still kill him. No problem…” [After not being killed...] Five or ten minutes later… I saw them taking a doctor and another guy from an ambulance, and I saw them shoot [the two men]. The military guys stole the petrol from the ambulance… The ambulance said “February 17 Misrata” on it. [February 17 is a sign of support for the rebels. ]…The men did not resist at all. They were medical people. Another witness to the same incident, Juma’ Al-Murayd, 31, told Human Rights Watch that two people with dark skin and in civilian clothes were driving the ambulance when they dumped three [black] bodies next to his house on the dry riverbed between Bab al-Aziziya and Gargur. 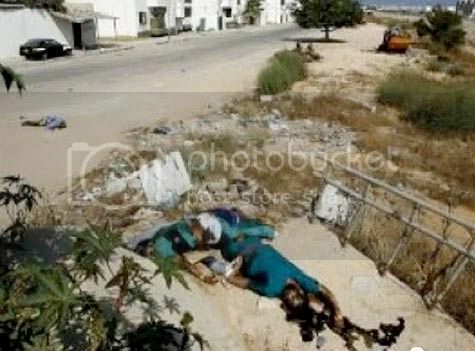 Human Rights Watch inspected the three bodies with Kikli, across from Al-Murayd’s house, two of whom were wearing the green medical scrubs that doctors and nurses wear in Libya. Kikli said that the third body, dressed in civilian clothes, was that of the driver. Khoms Torture System and "Death Group"
Khoms, or al-Khums is a coastal city of about 200,000 in Libya's west, about 70 miles southeast of Tripoli. Leader Muammar Gaddafi gave a speech in Khoms July 26 (video), and there was a Pro-Gaddafi demonstration there on Aug 15 (video), with NATO bombing that day, before or after I'm not sure (video, video). All this was because Khoms was the last major milestone for Misrata rebels pushing towards Tripoli's eastern flank. The UK Guardian reported on August 19 "By Friday night, however, opposition leaders said [...] their column had reached the outskirts of Al Khums [...which] commands the last significant road junction before the capital. Rebel spokesmen in Misrata said their forces were now in a valley not far from the town." Amnesty International was told the city was only taken on 21 August, when fighting in Tripoli's eastern front had already started. So it seems the city actually fell prior to that day, on or around the 19th. Of some note with Khoms is the name similarity with the Siryan city of Homs, the third largest city and epicenter of the revolt there. For the Syrian city, Wikipedia gives the Arabic name as حمص‎, and for the Libyan city the slightly different الخمس. The Syrian entry does however disambiguate, saying "for the city in Libya, see Khoms." And Google Maps actually gives the Libyan city as "Homs." This probably has no cosmic significance, but a literary propaganda tie-in might be detected and exploited by rebel myth-makers. Placing some of their good-vs-evil narratives there might link a minor city in their war to a larger sister city and hint at the "Arab Spring" legacy struggling still to make headway in Syria (with some more direct Libyan help, we're learning), Therefore it's worth noting. What's under study here is the allegation the city was turned into a special police state of terror more acute and "instructive" than usual of the Gaddafi regime's cruelty. I do not rule this out, but definitely do not just accept it either. I'm interested in the evidence for it that's been passed onto us from rebel sources via the compliant global media. In particular, I draw on an exclusive report from Reuters. The brutality of Gaddafi's forces in the capital, Tripoli, in the final, chaotic days before rebels overran the city has been well documented [sic]. Dozens of bodies were left lying in the streets, and witnesses described prisoners being massacred before their jailers fled. Wrong. The Tripoli massacres of just before, during, and/or after the rebel takeover are quite real, but there's been no documentation of loyalist authorship. When there's any evidence beside baseless fighter claims, it's from dubious accounts from miraculous survivors. These are usually at odds with the physical evidence and timeline clues, and often the eyewitnesses even disagree with each other when that's possible (when there's more than one survivor or more than one story). But accounts from Khoms paint a different, and in some ways even more sinister picture. Months before the rebel victory, and out of sight of the outside world, Gaddafi was operating a system of torture - separate from the army and police - that was so well-organized the units has their own command structures and bureaucracy. A photo is shown of "a man who said he had been tortured by Gaddafi's forces" lifting his shirt to show his back, marked with injuries from something like whips and flails, perhaps. The man is in Khoms, and that's about the clearest proof this provides as support for the story. On a wall at a construction site just outside Khoms that one of the units used for detaining suspects, pro-Gaddafi forces had scrawled in red crayon the name of their unit: "Soqur Al-Fatah" - or "Hawks of Al-Fatah," a reference to the 1969 Al-Fatah Revolution that brought Gaddafi to power. Underneath that, in the same handwriting, someone had written the words: "Death Group." An abandoned work yard is an open space where government forces in their final days there, or rebel forces in their first days, might take captives to torture and kill. We have writing on the wall, specifically and literally in crayon (which over here usually means Crayola, for children), as proof of the groups existence. Personally, I don't see why the "death group"would need to remind themselves who was in charge, nor advertise it to anyone else. We hear they burned the containers where 18 suffocated to erase signs of their crime. So why scribble it on the walls and leave it there? I'd consider this closer to proof that someone else wanted to suggest that, but really it looks too stupid to clearly prove either case. Scattered around the building where the torture took place were invoices for fuel received by the unit, and printed forms which were filled out to record what weapons and ammunition had been allocated to unit members. The forms were printed with the words: ""Temporary General Committee for Defence, Suqur Al-Fatah Security." At the bottom, the documents carried the name of the unit commander, Ali Ayad Beshti. The official in the new local council, Al-Menshaz, said he believed Beshti had fled to Bani Walid, a town south of Khoms that is still under the control of Gaddafi supporters. "We think they all left in that direction," he said. That's good evidence that a speciial security unit was set up to deal with the deadly, NATO-supported insurgency - not surprisisingly - and that they bought things, were commanded by Beshti, and had the receipts to prove it. These were either found at the construction site, or found elsewhere and brought there. We can't say for sure. In a room at the end of a long corridor at the main Khoms hospital is further evidence of the campaign of repression. Fifteen bodies lie on the floor, wrapped in canvas shrouds with a number pinned to each of them. There is no mortuary at the hospital, and the room has just an air conditioner. The smell of rotting flesh hangs in the air. To approach the bodies, local fighters guarding the hospital each put on three surgical masks, one on top of the other, and douse them in alcohol to counteract the stench. A fighter steps into the room and pulls the canvas away from some of the bodies. They are wearing civilian clothes. One of them has his hands bound together with a belt. The head of one body is missing. These had been previously buried, the report adds, and "were brought to the hospital on Sunday night after they were dug up on the edge of the Sidi Muftah cemetery, just outside Khoms." It's not specified what kind of skin they had, but I wouldn't be surprised if they were primarily black. Gaddafi apparently hated black men. The new local authorities knew that there was a burial site somewhere because, after Gaddafi's forces fled Khoms, residents had been coming forward to report that members of their families had disappeared. When a resident said he had seen lots of vehicles coming to the cemetery at night a few weeks earlier, they brought in a mechanical digger. They found the bodies buried head-to-toe, in two lines of trenches by the wall of the cemetery. At the makeshift mortuary, a Bulgarian woman who works at the hospital looked on as a group of men, masks over their faces, filed into the room to see if they could find their missing relatives among the bodies. They walked out again shaking their heads, saying the bodies were too decayed to identify them. "It's genocide what Gaddafi was doing here," said the woman. "Nobody would do what Gaddafi did." We have rotted exhumed bodies on September 6, and a rebel takeover acknowledge only on August 21, but quite likely a few days earlier. Traffic to the cemetery was reported "a few weeks" before September 6 - if taken as 2-4 weeks, that's somewhere between the 9th and 23rd of August. The witness might be fudging backwards, but the apparent burial does sound like something shortly before - or possibly shortly after - loyalists lost control there. Below are various comments compiled from other posts, by Felix and Petri Krohn, unattributed here, awaiting a re-assembly by myself. I invite more temporary clutter and further thoughts below. For a little more on Khoms and rebel tales of regime villainy there, see this post. On September 8, the captured soldier took Tweer and a team from al-Khoms to a remote site called Wadi Dufan between Orban and Bani Walid, about 60 kilometers south of al-Khoms, where they exhumed the 18 bodies. Around 11 p.m. they brought the bodies by truck to the morgue at the Tripoli Medical Center, where they were briefly inspected by Human Rights Watch. Tweer said the bodies were of the men who had died in the containers. Survivors - at least five? Abdul Rahman Muftar Ali Ahmed Sharif, 23, shows where he was bound to be tortured in a factory in Khoms, Libya, Sept. 7, 2011. During the last days of the Gaddafi Regime he was held in a shipping container with nine others, who all died of suffocation or dehydration. Sharif was taking part in protests against Gaddafi and he thinks he was arrested because someone saw him spraying anti-government grafitti. No other reference in English shows this name, or this exact version. Mohammed Ahmed Ali, [a teacher of Arabic, 54, per the Telegraph] with voluminous white beard and cool shades on the top of his head. 2 Sole survivors...(from 2 different containers..), it is a familiar pattern. described a record of abuse, torture and the extrajudicial killing of captured pro-Gaddafi fighters that has followed the rebels from east to west as they have taken over the country. Am I correct to assume, somewhat surprisingly, that Diana Eltahawy somehow completely missed the Khamis Shed / Warehouse massacre in Yarmouk?? Amateur footage obtained by Reuters purports to show anti-Gaddafi fighters being tortured in what appears to be a shipping container, while residents of the Libyan town of Khoms, 60 miles east of Tripoli, have unearthed the bodies of 17 men in a mass grave is the Guardian's title. The video maker (Guardian site) is taken around a site by one . The whole scenario reminded me greatly of the Tripoli shed episode, without the burning...and of course a mass grave was dug up too. "“It was all part of a deliberate strategy,” said Nabil Al-Menshaz, an official in the rebel council which took over Khoms after Gaddafi’s rule there collapsed last month"
2) The rebels used this reasonable impression to illustrate their cover story for 19-ish people they themselves killed somehow, making sure the video and story surfaced together and remained linked. Toward the end of that day, the guards opened the doors of the two containers. They took out Ahmed Ali, and the one other survivor. They allowed them to wash, dressed them in military fatigues and soon after let them go free. He said they took the bodies out of the containers, then poured petrol inside and set light to it to get rid of any evidence that people were held there. Later, a man contacted the new authorities and confessed to having helped bury the bodies at a place called Rbane, south of Khoms. Local rebel fighters said on Monday they had found the burial site and were starting to recover the bodies. The blood was from his head? It's a story with enough detail it sounds plausible. But questions remain. His name is given somewhat differently, but it's the same guy. His father, in a pristine-white jalabeya and skullcap, stood watching at his bedside. Hadi was arrested on August 15, five days before the uprising began in the city. He said he had been staying at a house in the Janzour district when 15 armed men came, blindfolded him and took him away. He said he was innocent and claimed to not have been part of the opposition. Others he met in the makeshift prison had been there longer, for more than two weeks. Most, he said, claimed they were civilians, picked up off the street while walking or riding bicycles. He said that Tuesday, as the rebels entered the capital, the prison guards ordered all the inmates to lie on the ground and opened fire on them. He said he was hit. "Allah gave me a chance to survive." Human Rights Watch describes and shows a photo of the spot Mr. Swayi told them he was held. 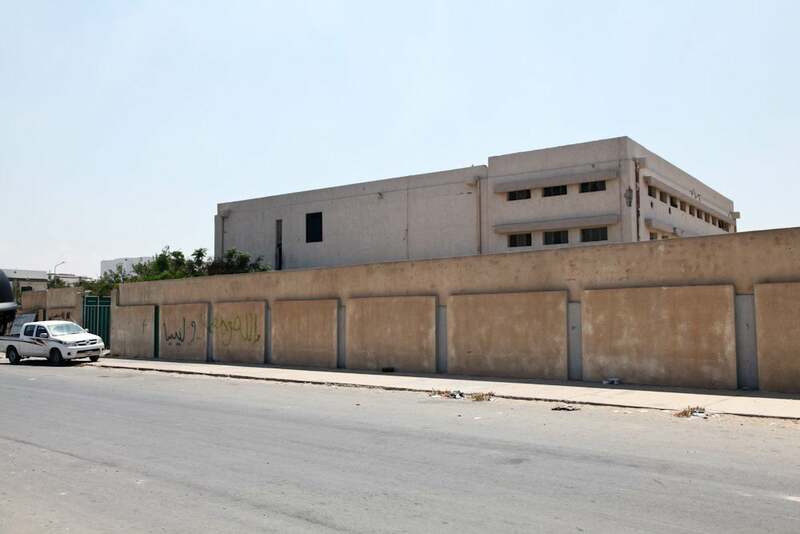 According to one witness who survived the killing, Libyan security forces shot the detainees at the Al-Amal al-Akhdar building belonging to the Libyan Internal Security service. [...] On August 26, Human Rights Watch also found two additional bodies in the closet under the stairs in the Al-Amal al-Akhdar Internal Security building where Al-Swayi said he had been detained for two days. Al-Swayi told Human Rights Watch that two men had also been killed on the ground floor where he was held just before the massacre, not in the courtyard. It could not be confirmed that these corpses were of the same men. No, one of those victims at least was clearly bled dry on-site [grisly HRW photo]. for Hadi and 25 other civilian men, held by armed Gaddafi loyalists at a rundown apartment building now serving as an warzone detention center, a horrific massacre was about to begin. Many reports say the men were executed and found inside the Bab al Aziziyah compound, as opposed to near it. These may be nothing but second-hand simplification. As machine gun and artillery fire engulfed at the compound across the street, the captors marched Hadi and the other men into the street at gunpoint. They were lined up with the walls of the Bab al-Aziziya behind them as the sounds of the regime’s downfall split the air. Then Gaddafi’s gunmen opened fire, spraying a barrage of bullets into their captives’ heads, necks and chests. No, there was no cell in this outdoor killing, and no claims of grenades. Clearly Dr. Ali was just mixed-up which atrocity they were trying to explain at Mitiga on the 25th. The grenade victims were still down at the Yarmouk base, perhaps being charred blank by Misrata monsters at that very moment. Doctors said the group had been prisoners of Gaddafi troops in Tripoli and were tortured and killed as the rebels seized the capital earlier this week. Dr Hoez Zaitan [sic - given more widely as Dr. Moez Zeiton], a British medic working at the hospital, said about half the bodies had bullet wounds to the back of the head while others had disfiguring injuries to their limbs and hands. Nothing in al-Sawayi's story seems to explain these injuries. 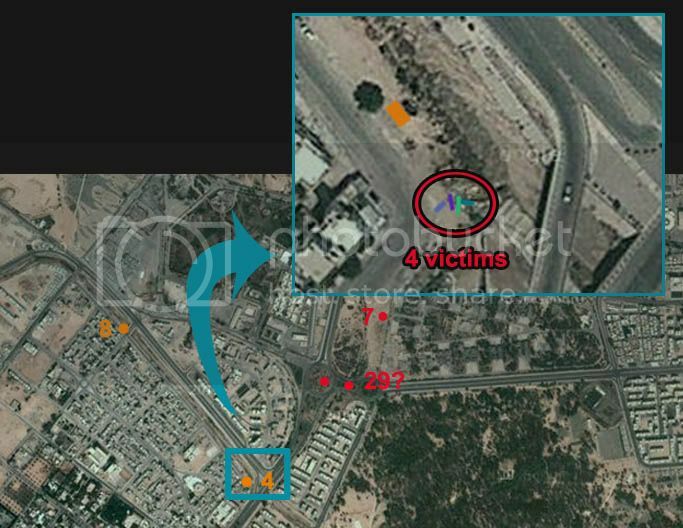 This is regarding a "Tripoli massacre" I've neglected until now - 25 or so people allegedly executed near Gaddafi's Bab al-Aziziyah compound, found and turned to 17 corpses and a survivor seen by many at Mitiga Hospital in the east of Tripoli. The details will be worked out in at least two sub-posts, then simmered down for a summary here. All visual clues for the 17 corpses taken to Mitiga Hospital. It's partially headed by one Dr. Salim al-Ferjani of Tripoli Medical Center, a hotbed of rebel medical propaganda. He's already surfaced under a false name (Dr. Salem Rajub) as a false witness to a disputed incident with uncertain identities involved (see the previous link). He decided from what he "saw" that Gaddafi loyalists had killed the roughly 150 captives of the Khamis Brigade shed massacre. Under his other name, al Farjani showed the site of that incident to UNSG Ban Ki Moon on November 3, where they gave him as "the acting Chairperson" of the commission. Mentioned in late November as jointly heading the commission with Farjani was a DNA specialist, Othman Abdul-Jalil. [VG] The DNA part of this "National Missing Persons Commission" can be quite helpful if done right, and I have no cause to doubt Dr. Abdul-Jalil's ability. But something tells me this is added just to sound fancy, and will have little effect on the process, besides sometimes giving it a sheen of hard science. If the National Missing Persons Commission was for real, I would assume they would have some presence on the web. I have found nothing. [Prime Minister Abdurrahim El-Keib] will head a 24-member government which will include such portfolios as the ministry of martyrs, wounded and missing people, and a ministry of civilian society. There is an important point noted by Mohammad Miloud Benhammed, the vice president of the Mitiga missing persons group on this Russia Today video. Families of dead Libyan Army soldiers and other Gaddafi supporters will claim that their relatives were "civilians caught in the crossfire" – this when speaking to the only neutral party in Libya. With a little pushing and some help from a Massacre Masseuse any dead Gaddafista can be turned into a revolutionary martyr. Who would want to be related to a dead servant of a dead tyrant when a far better afterlife is on offer as an icon of the revolution. Around sunset: Alleged slaughter in the shed behind the Yarmouk military base, by general consensus. This date is well-supported (by witness accounts if not verifiable facts) but has two variants. Bashir al-Siddeq said it happened "Monday night," the 22nd, and an unnamed witness said "Last Wednesday [Aug 24], sometime after the early evening prayer, I heard the sound of heavy gunfire and grenades, then complete calm." [HR] The former is supported by another witness and via him, by news giant CNN. These outliers could be simple cases of misspeaking or mistranslation, or possibly a clue of something else, but the majority I won't bother citing puts the story firmly on Tuesday the 23rd. Even those who disagree on the date or other details agree in specifying roughly sunset (7:44 pm in Tripoli that day [WC]), or as late as 8pm (per Rafaii), if any time at all. 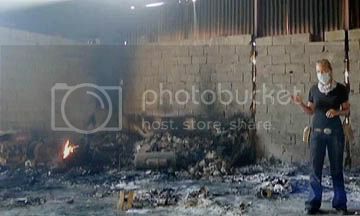 The alleged attack had about 150 prisoners in an agricultural shed/barn/warehouse/hangar killed by members of the Khamis Brigade (32nd brigade), using machine guns and hand grenades. 45-53 of these bodies were only later burned to the bone inside the shed. It's the only known massacre to involve that number of dead and to include grenades to explain the mangled remains. Tuesday Night: The bodies are burned, with many of them still alive, by a few accounts. Most, however, do not mention this. Tuesday Night or Earlier Yet: Rebels conquer the Yarmouk base and size up the aftermath? See below. The location isn’t given, but the use of grenades and number of dead match only with this massacre (see here for a more explicit explanation). "Cells"in a jail are mentioned, as opposed to an open shed (requiring quite a few grenades). But if the batches are the same, rebels have already taken the base, found and/or made about 140 corpses, and announced an explanation for them. There is no mention of burning yet. This looks more yet like the same massacre, as few others featured any burning of bodies. How they know ten or less survived isn’t clear. When the bodies had been burnt is unclear, but quitepossiblyafter being recovered. That the main fire was set yet is doubtful. The location still isn’t specified, but it doesn’t sound like the shed (yet), with the reference to "rooms," though these each "contained many," as opposed to individual cells. The rebel fighters know nothing, and hope the hospitals or morgues will be able to tell them what happened to these people they …handed over to them? Wed/Thu: Business as usual? 32 Brigade remains in control of the site, allegedly. From the little I know, August 24 is the latest time anyone killed there would likely be crawling with maggots by Saturday the 27th, as Der Spiegel noted for an un-burnt body. [DS] Late on August 25 (Thursday), or perhaps the following morning, or the next night depending on the narrative, is the most logical burn time in the accepted version (the latest that it could happen under Khamis brigade control). Daylight hours: August 26 is the date on a set of six photos, apparently shot around the middle of an overcast day, showing the shed interior and the victims just outside it. victims outside. These photos by Daniel Berehulak, Getty Images, were taken a day before any other media footage of the shed. The description is later and notes the charred bodies "discovered" the following day. He’s got the same basic story the Misratans reported, but has it six miles north, inside Gaddafi’s own compound. That's odd. Friday, 23 Escapees Known: ITN News speaks with two brothers who escaped a version of the massacre with “more than 120” killed in an open common area, with five grenades, more than 120 victims. [IT] Amnesty International has already spoken with several escapees of the shed massacre, two of which (Lafi and Saleh) were named in a report issued this day. The shed is rightly described, but no mention is made yet of burning. They have already learned of all 23 survivors they would later know about. The location is specified and given correctly here for the first time. Sky News: posted 10:29 pm August 27, filmed mid-day, with shadows short, light slightly from the southeast. [SK2] Telegraph Video, posted 9:13pm, suggests an earlier filming yet, with the shed's southwest face still barely in shadow. [T3] Video analysis of sunlight direction give a solar azimuth of about 113 degrees for the Telegraph's video, and 145-155 for Sky's. Using the rough coordinates 32.46.33N, 13.12.50E, the date, and the magic contained within NOAA's solar calculator, the Telegraph filmed at about 9am, and Sky at around 11am. Both had almost exactly a twelve-hour delay getting the videos up, and they became by and large the next day's news. Human Rights Watch was there to examine and photograph the place by late afternoon, judging again by shadows. They counted 45 distinct human remains in the shed. [HR] Witnesses in place to speak on the 27th: "Moftar Abdullah," Dr. Salem and his unnamed survivor friend, Rafaii, Boukhatwa, Abu Ghraim, A.M. Haleem, and an unnamed local, at least. More widespread media reportage on the massacre, and many more witnesses, especially from inside the shed. All continue to implicate the loyalists in charge on the 23rd, and while conflicting on important details of how it happened, they confirm from one to six grenades were used and up to 30 or more escaped. 53 charred bodies are repeatedly counted within, apparently in addition to the eight outside the shed. Approximately 100 more are believed hidden in or near the compound, but not unearthed yet. 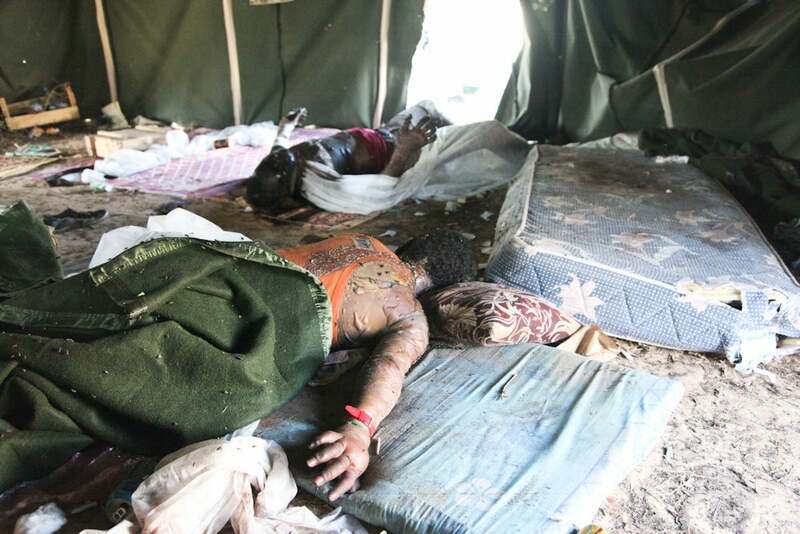 Late Afternoon: The bodies have all been found and removed, as CNN's Arwa Damon reports, saying about 150 burned bodies had been removed from the shed itself, according to volunteers. [CNN1] This might be a simple mix-up, with the other hundred taken from ... elsewhere easily found, or with the other 100 being fictitious. But this visit is also unique in showing not just smoke rising from the almost human-free debris, but, as shared in a later broadcast, open flames (see below), [CNN2]. This too may or may not have an innocent explanation. ABC (Australia) footage captures a ninth body found executed near the shed. Nothing is obviously different at the vacated shed itself (see here) . [AU] After nearly a week, the on-site saga seems to be about done with. Majid Fayturi, a fighter from one of the Misrata units involved in the storming of Brigade 32, blamed the grisly massacre on Gaddafi forces pushed to retreat by rebels. I was wanting to bold every word there for possible irony, but that would only dilute the effect. In conquered Tripoli on the 26th, after the "last base" had fallen, the guys inside just slipped out and ran away to wherever, every single one of them? Or have we seen them - just behind the base, mostly charred now? [SK2] Mass Killing' Evidence Found In Libya. Sky News.10:29pm UK, Saturday August 27, 2011. Stuart Ramsay reporting.